One of the popular television channels on the Belgian television for children and young teenagers is ‘Ketnet’. This channel has been around for quite a while and has a variety of shows. One of the more educational programs that are aired is called Karrewiet. Recently, Ketnet has released a board game from this popular show. If you’re looking for a Dutch board game that you can play with your children, it is a good idea to read further. The overall contents are somewhat simplistic, especially the actual game board and the switches, as they look somewhat on the cheap side. The foam pieces are very reminiscent of the puzzle cubes you could find in pretty much every toy store in the nineties. The cards have a rather flashy, but very appealing appearance, making them fun to look at, and work with. Don’t expect too much, and the game will certainly meet said standards. 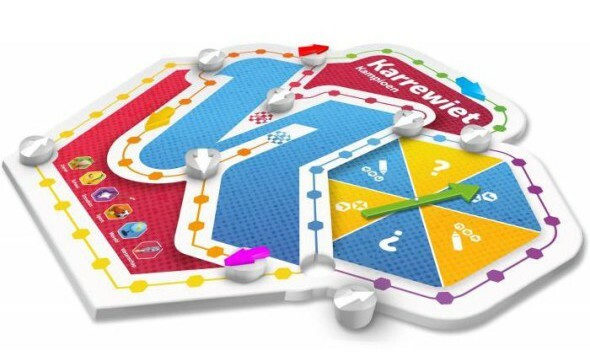 Karrewiet is quite similar to Trivial Pursuit but there are some different mechanics implemented while the difficulty level is fairly lower. This makes it rather fun and educational game for children but you might have a hard time to lose on purpose (unless you like to be victorious and bathe your children in defeat). The goal of the game is to complete a cube by collecting six different colored foam sides, whith each color representing its own topic or theme. Up to four players can compete, who then choose a pawn, and the one who rolls the highest number on the dice can start. The game board is divided in several sections, each with a different color, and there are switches to guide you to a certain path. After rolling the dice, the player has to move his pawn accordingly, while passing the switch also counts. Depending on where it lands, you will need to answer a question or if you ended on a switch you’re in luck and you can pick a topic. The person on the right of you will take a card and states the subject. Before you can dig into your brain to find an answer, you need to turn the spinning wheel to determine what kind of question you will need to answer. There are open questions, queries where you need to pick the right solution out of three possibilities and questions that are true or false. When the result of the spinning wheel is known, the quiz master will then phrase the question. There isn’t any time limit, which is great since the game is meant for children. Once the answer is given, the quiz master checks and rewards the player by a piece of colored foam if the question is correct. Of course, it could be that the player already has that specific color. If that is the case, he can play another turn and try to go to a different location on the map. It would have been easy if you only needed to collect the six pieces, but you also need to get to the end goal. This is where the switches are quite important. After someone answers a question, that player can choose to turn one of these switches. By doing so, he can open the road for himself or annoy his competition by closing off their route. The only condition is that there isn’t any player directly on the switch you chose to turn. Only that specific player can switch his own gate. If you’re able to throw (more than) enough eyes to get to the goal, you’re the winner! This game has some mechanics that actually will cause both luck and strategic thinking. For starters, you’re playing with a dice, so it will depend of the amount of eyes your roll is, if you’re able to get to certain parts of the game board or not. Of course, if you already have that colored foam piece, you can continue your turn and get there eventually, implying that you can answer the questions correctly. This is the next part of the luck aspect, as it will also depend on the questions you pick. The spinning wheel also has a big part in this, making it harder to really plan out your next move(s). On the other hand, you can help yourself or sabotage your enemies by flipping the switches, making it possible to open roads or blocking others. If they bump into a switch, they return where they came from, making it possible to prevent them from getting certain colored pieces. It is a good idea to plan ahead and determine which colors you need to get in combination with the ones you (possibly) obtain by landing on the gates. If you’re looking for a fun, educational Dutch game then Karrewiet is something for you to consider. It is based on popular program and will surely have some new information for your children. As it has both luck and strategy-based elements, it will be harder to win although that might not so bad when you’re competing against your children.